After (digitally) reconstructing the aspis found at the vatican museum, I have come onto a problem. 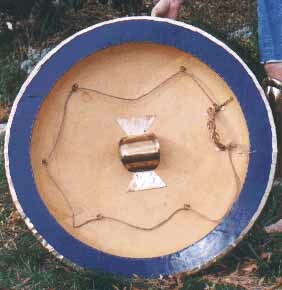 The aspis measures about 82 cm in diameter. According to what I have read, this is on the shorter side of aspis, with the smallest found at about 80 cm and the largest over a meter. The average height in ancient greece was substantially lower than today. Let's say about 170 cm for simplicity. On to the problem. 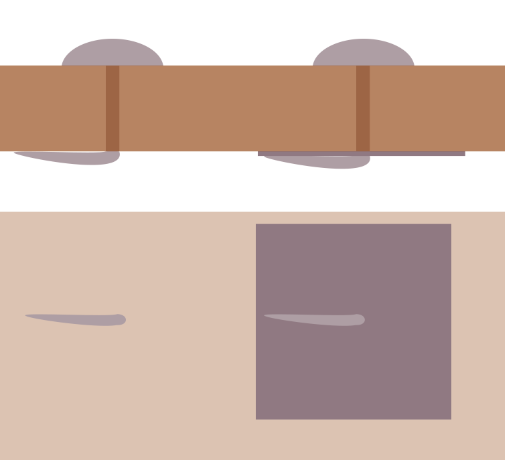 The length of the back of the strap you put your arm through, to the grip is about 30 cm. I am above 6 feet (183 cm), and this seems too long for my arm. My forearm may be on the shorter side, but still, this seems too long? What am I doing wrong? How large should the aspis be compared to the person carrying it? Here's manning imperial's aspis. It's not a direct copy, but similar. It's about 91 cm, and they've shortened the distance to the grip to a reasonable ~26 cm. Only problem is the grip is "supposed" be much closer to the rim. At least according to all painting I have seen (and the vatican aspis itself). Only two options I can think of is that the strap is somehow smaller and or that the rope for the grip would be longer. Last option is an off center strap and grip, which the vatican aspis does not have. 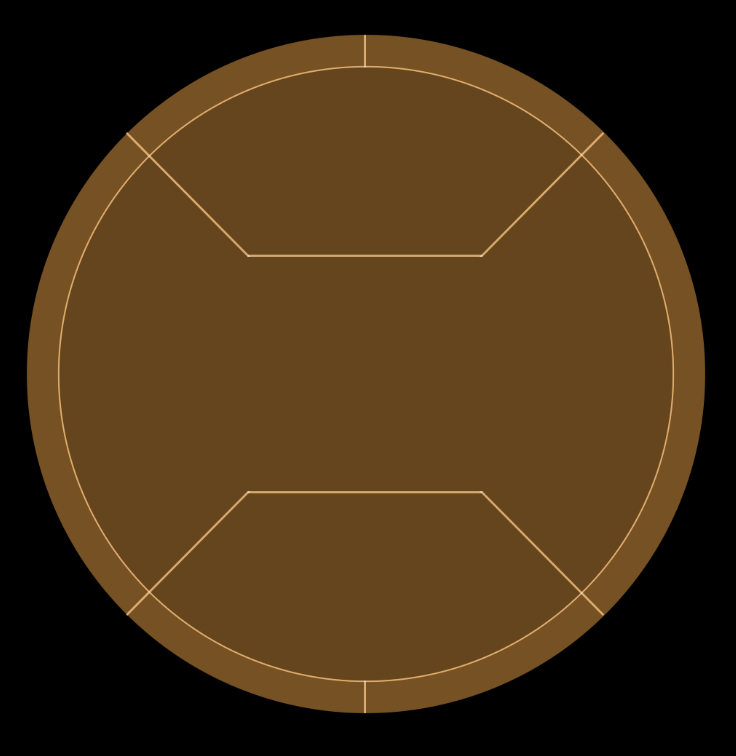 If my measurements are not all wrong, at best this would leave it for a relatively large person (especially at the time), but does not explain how this shield could be on the smaller end. What makes you think that all the grips on all the shields were located in the same position? 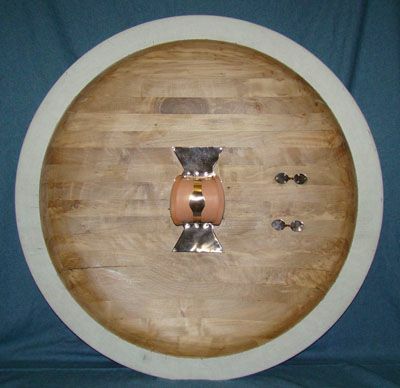 The bowl and furniture may have been mass produced in a factory but the customer would have been consulted and measured before the fittings were attached. The porpax and grip were located wherever they needed to be to fit comfortably on the wielder's arm. This is from Matt's site. 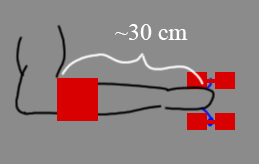 Note that the hand grip is offset a little from the porpax (arm band). On this one the porpax is not located in the center but moved up and to the right a little. What makes you think that all the grips on all the shields were located in the same position? Is having the grip very close to the rim essential? Or could it be placed like mannings? The reason I'm fixating on having the porpax in the center is because this particular aspis has that. That coupled with the size of the aspis. Is it possible that later italian aspis were generally smaller? 30 cm from far edge of porpax to center of grip is almost too close for me. But I'm tall with longish arms. Manning, like the ancients, makes these to their customers specs so don't get too caught up with following to the mm an artifact or a well made reproduction shield. I recently handled a small 74 cm Manning made aspis for a rather small professor of Classics, I joked it was kid sized. Actually, it's probably not small at all considering the probable average height of a protein deprived Greek hoplite. Most estimates of the average heights of adult men who received a visible burial in the classical and Roman world range from 168 to 172 cm; today the average for all adult men in rich countries is usually around 173-175 cm, maybe as high as 180 cm in Scandinavia and the Netherlands. In the ancient world there were quite a few men who just got shoved in a pit when they died, or even dumped just outside the city limits or fed to the pigs, so "men who received an archaeologically visible burial" is not "all men," but the ones who are invisible were not the ones likely to serve as hoplites. The height and overall health of ancient Eastern Mediterranean folks is a subject that comes up quite often where I volunteer as it's uniquely an archaeology and anthropology museum with a world renowned hospital next door with all kids of technical gadgets to measure long dead bodies. I can say this for sure, the average person living back then was considerably less healthy than the average person living today in the same region. The science is settled and not at all surprising. The reasons are simple, the "Mediterranean Diet" that is supposed to keep everyone healthy is probably enjoyed by far more folks today than in the distant past, we know what poisons us slowly such as lead and access to healthcare is more widespread. In the pool of "average" ancient folks are of course millions of slaves, local and imported. Although these would not be used as hoplites in most cases, many lower class free folks would as all one needed was a shield and spear, for the most part. It's hard with the limited sample size we have of ancient folks to know what the average person's height was, but we do know a lot about their diets, types of labor and how that impacts the body. I'm guessing only 2" difference between ancient Greeks/Romans and modern ones is a bit on the low side. When one looks at a lot of ancient Greek helmets in museums it's easy to note how small most are, even if they were to be tight on the noggin. Again a small sample size, but when you consider how small in size many of the other armor artifacts are a picture can be drawn and these guys who had bronze helmets, upper body armor and leg armor were the best fed, healthiest and best trained of the lot. I'm not saying they were all as tiny as my professor friend, just noticeably shorter. This is somewhat unrelated, but do you know of any stitching patterns in relation to the inside of the aspis? Do you know where the osprey people got their pattern? Did they make it up? I'ts hard to see, but this is what the pattern they use looks like to me (I have stitches at the rim as well). It seems off. You mean for the shape of the pieces of leather covering the back? No idea what they're basing that on, there may be lines visible in artwork but I've never noticed, nor looked for them. I would assume it depended on the pieces of leather you have! And getting it to fit that shape neatly. I see, thanks. One more unrelated question if you don't mind. 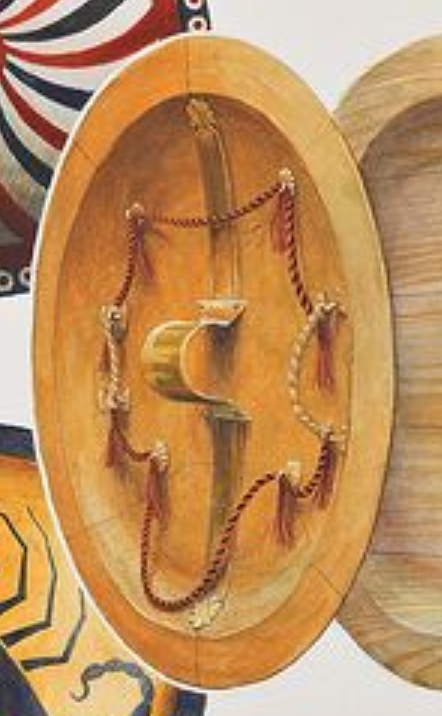 Is it known if nails of scutum and other roman shield bosses are peened or or quenched on the backside? 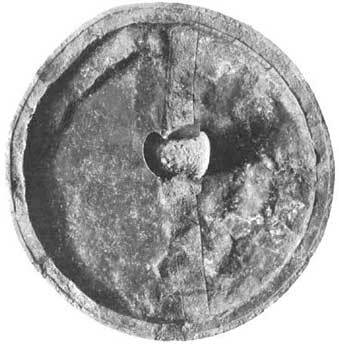 If it is quenched, does it for some reason also have an iron plate between the nail and the back of the shield, as it (probably) would if it was peened. Right showing quenched with extra plate between. Oops, you mean "clenched" or bent over, not "quenched" (heated red hot and cooled quickly in water or oil)! But it's a good question! And it's been too long since I looked at things like that, but I *think* they usually peened the nails like rivets, with a washer (extra little plate). That's what I usually tell people to do, so I hope so! I have heard both claims but I found little evidence either way. I'll keep looking.